Because this well could be the most asked question in recent times, I thought it was high time I put all the paint colors in one post. Here’s the only glitch. I can’t remember the paint color of the girls’ vanity and I keep forgetting to call and ask my cabinet maker. I’ll do it, I promise. Also, for your viewing pleasure, I’ll include pictures of the rooms, along with the colors listed. It’s all because I love you and I’m so exhausted from my run with Caiti today that I’ve decided the rest of the day today must be dedicated to things I can do while lying face down on the floor sitting down. All colors are Benjamin Moore except Sea Salt, which is Sherwin Williams. Full living room post here! Full kitchen post with sources, here. Full Girls’ Room post here! 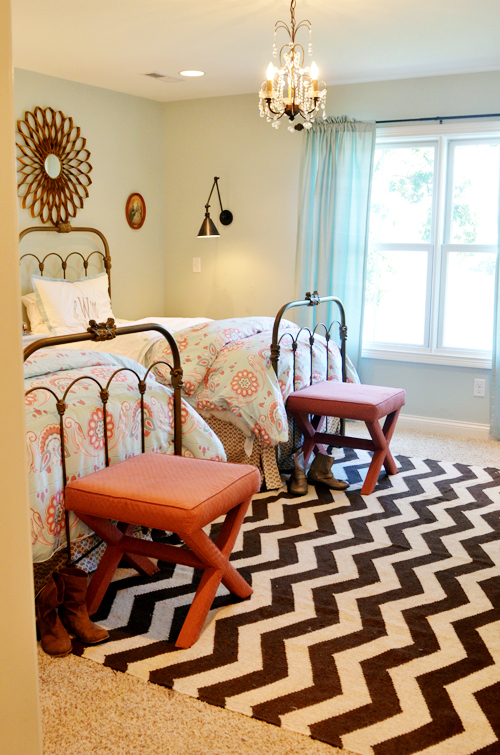 Full master bedroom post here! There’s now a link to this post in the sidebar so it’ll be easy to access. Hope your weekend is full and happy! Beautiful, as always! Love your style. Love all your colors and they look beautiful in your home! Seamless and lovely! Thanks for sharing, Edie! I love your colors. I’m trying to pick a color for my living room and have not decided yet. I can’t wait to paint it and spruce things up. Your home is just gorgeous. Everything looks perfect!! You have an amazing gift for decorating and use of color. I am amazed every time I see photos of your home. Thanks for sharing your life and talent…. such beautiful colors!! love, love, love how well they all flow and work together. 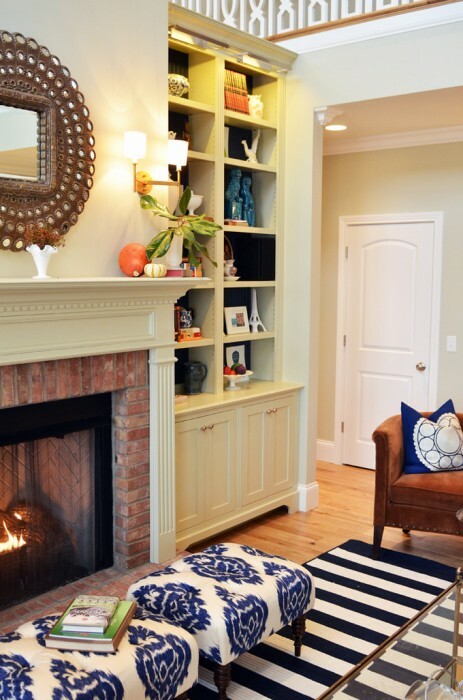 will you let me know what you used for the trim color in your living room? Thanks for sharing your colors! Beautiful, beautiful! LOVE them all, of course. That graphite is the bravest…amazing depth and personality in that bedroom of yours! And I’m always a fan of sea salt. Love those colors! Your home is beautiful! Hi, My boyfriend and I are painting his livingroom. All his furniture is dark wood, he has a chocolate brown couch, with white mouldings. We were thinking a dark brown, or a caramel, as was want it cozy. There is lots of light in the room because of two big windows. What do you suggest for a color? What is the trim and ceiling paint color in the girls room? 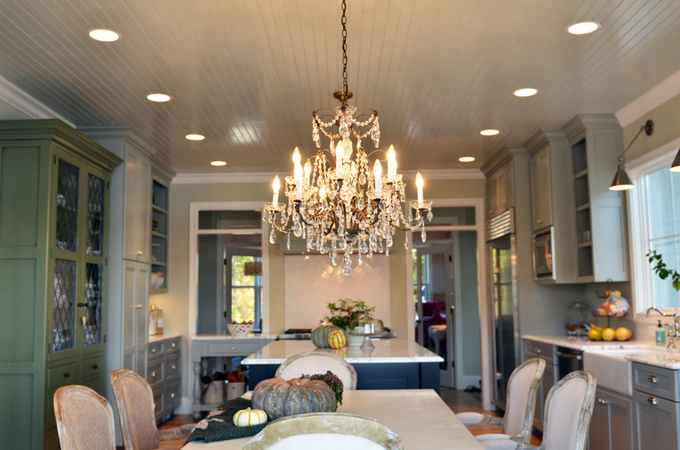 Love the chandelier in your kitchen!! Where is it from? Love your home & your blog!! 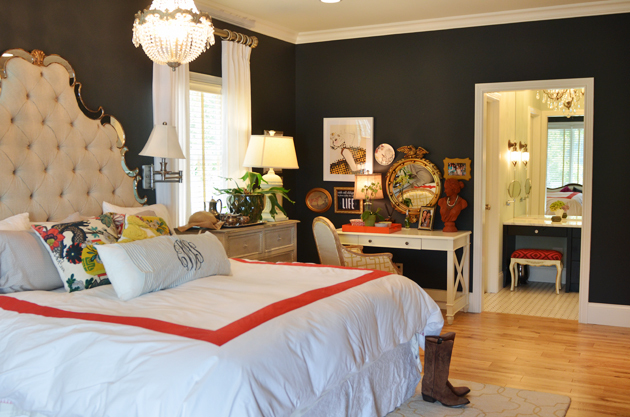 Edie, your paint colors are gorgeous! I actually have Sea Salt in my powder room :). It was the first room we painted and it’s a great color! 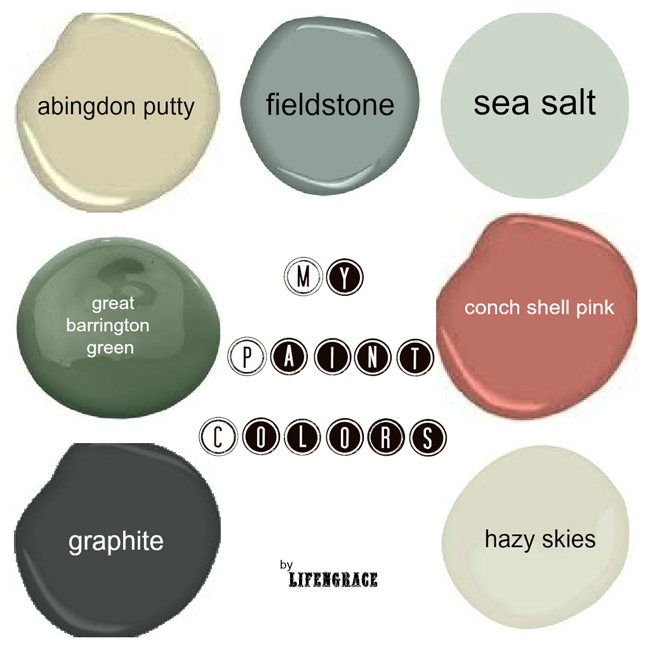 I’d love to feature Conch Shell over on my paint color blog. The name makes me want to take a trip to the Caribbean, and it looks beautiful in your workroom. You wouldn’t have to do at thing for the feature, just let me know if you’re interested! I am about to redo/update my girls’ bathroom and I love your girls’ bathroom vanity. Can you tell me what color it is? I’m just wondering what sheen you painted your walls – especially the graphite. Thanks! Your girl’s bathroom and well, everything you’ve done is my inspiration in finishing my basement. 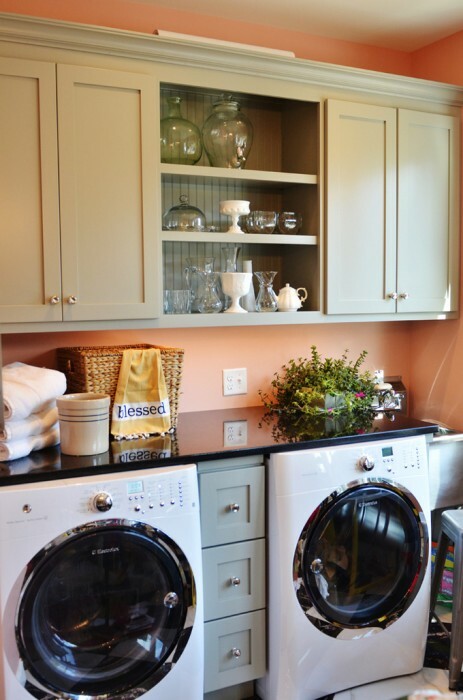 I know it has been almost a year since this post and you’ve mentioned that you don’t know the red vanity color, but I didn’t know if you’ve by chance had time to check with your cabinet maker yet or not. I am going to be finishing my bathroom in a few weeks here, and would love to use that color. It is so hard playing the guessing game, especially seeing it through a computer screen. The color is just so beautiful! Thank you so much for your time and willingness to share you amazing ideas. I appreciate it! What?? Your kitchen is a mix of Hazy Skies and Abingdon Putty?1? Can you be more specific, because I’m really liking your kitchen color. You see, I’m getting a little desperate choosing a new color for my old kitchen. I’ve had this great shade of green for 16 yrs (yes I said 16), but I need a change. (It sounds stupid, but things like this can tie me down, put a halt to progress, mess me up, rock my world;) The room next to the kitchen, which is a cream/yellow/light goldish ( but separated by white trim), needs to mesh with the kitchen color. I wanted something greigish, but the Revere Pewter is looking pretty gray. Anyway, any suggestions?